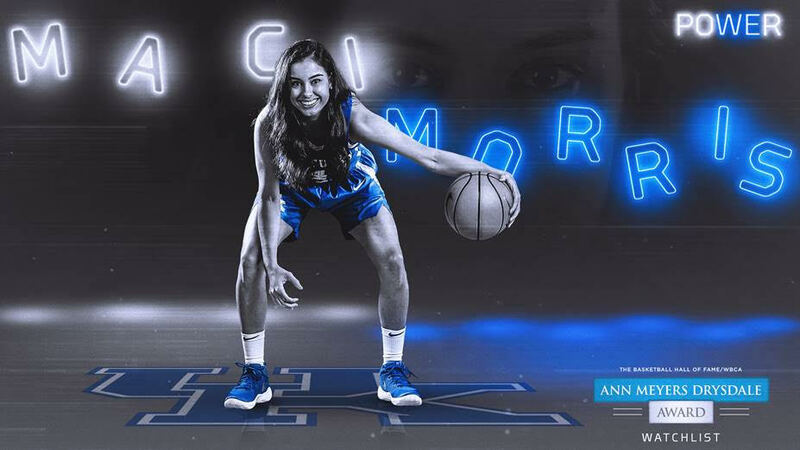 LEXINGTON, Ky. – Ranking as the program’s all-time leader in 3-point field-goal percentage and currently sitting top-10 nationally and first in the Southeastern Conference in that category, Kentucky senior guard Maci Morris has been tabbed one of 10 players to the Ann Meyers Drysdale Top 10 Watch List. Named after the first player, male or female, named to the All-America team in four straight college seasons, the annual award in its second year and recognizes the top shooting guard in women’s NCAA Division I college basketball. Last season, Victoria Vivians of Mississippi State was named the inaugural winner of the Ann Meyers Drysdale Shooting Guard of the Year Award. A national committee comprising of top college basketball personnel determined the watch list of 20 candidates in October, which has now been narrowed to just 10. In March, five finalists will be presented to Ms. Meyers Drysdale and the Hall of Fame’s selection committee. Fans will have the opportunity to vote for their favorite finalist at www.hoophallawards.com. The winner of the 2019 Ann Meyers Drysdale Award will be revealed in partnership with the WBCA at the Women’s Final Four in Tampa, Florida. Additional awards being presented and recognized at the WBCA Convention include the Nancy Lieberman Point Guard Award, the Cheryl Miller Small Forward Award, the Katrina McClain Power Forward Award, and the Lisa Leslie Center Award. Also being awarded is the Wade Trophy, the sport’s oldest and most prestigious national player of the year award which is presented annually by the WBCA’s community of coaches to the best player in college women’s basketball. Morris is having a great senior season averaging 16.2 points per game while hitting a team-best 62 3-pointers. The guard has scored in double figures in 20 games, including eight games of 20 or more. Morris’ best game came at Tennessee where she played 31 minutes before fouling out and scored 27 points with four 3s, three rebounds and three steals. The guard scored 25 first-half points against Morehead State which is the most in the first half by any UK player since at least 1982-83 (prior halftime statistics are incomplete before that). In her four-year career, she has 1,597 career points to rank eighth all-time, while her 239 career 3-pointers made ranks second all-time. Morris has a career 3-point field-goal percentage of 40.9 percent which is first in program history and her career free-throw percentage of 85.7 percent is second in program history. Candice White – Fresno St.
Teniya Page – Penn St.